DJ apps for tablets aren’t a new idea. 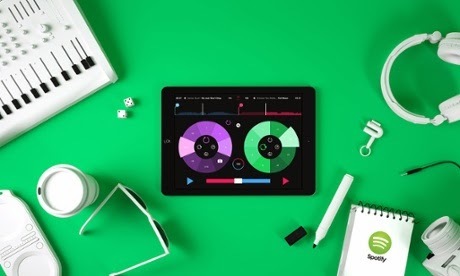 Apple’s iPad has already played host to two djay apps from developer Algoriddim, as well as Native Instruments’ Traktor DJ, which ditched the two-decks metaphor in favour of waveforms. These apps all relied on their users’ own files for the music, though. One app, edjing, took a different tack: it draws on streaming services SoundCloud and Deezer as audio sources. Now there’s another –Pacemaker – released today as the first DJ app to use Spotify as its source. Strictly speaking it’s the second app. Developer Musicsoft Arts released DJ Mixer for Spotify last October, but it was swiftly removed from the App Store after Spotify notified the developer that its ability to record mixes and upload them to SoundCloud was breaching the terms of Spotify’s API. Pacemaker is different: developed by the Swedish company of the same name working closely with Spotify, as a follow-up from a portable DJ device released in 2008. The new app enables you to crossfade, sync, loop and preview tracks (via a splitter adapter) from Spotify’s 20m-strong catalogue. It also sports a slick, neon-heavy design – it feels very iOS 7 – with intuitive controls that see you triggering effects by tapping on buttons on its deck-like circles and then sliding your finger around. Pacemaker CEO Jonas Norberg says the company released a version of the app first for BlackBerry’s PlayBook tablet, using people’s own music files rather than Spotify, before working on the new version for iPad. Rather than aim it squarely at professional DJs, it’s also targeted at enthusiastic amateurs. “We hope it’s accessible: we believe that there is a big bunch of people out there who want to do a little bit more than just passively consume the music. They want to mess around with it. That’s the kind of need we are targeting,” he says. I can see how this might be a sensitive topic for some DJs who’ve worked hard to develop their skills over the years, only to see apps come along promising to let anyone have a bash, complete with that sync feature – a whole other touchy topic in itself – to make the actual mixing less of a challenge. I’m not so sure this should be seen as a threat. Instagram has helped me shoot and share images that I’m proud of, but if anything, it’s increased my awareness that I’m not a professional photographer, and boosted my respect for people who are. DJ apps have felt similar: it’s been wonderful playing with them, but it’s only enhanced my regard for DJs who can actually mix tracks and construct sets. Norberg says Pacemaker saw “plenty of emotions” around its physical DJ device when it came out. “You could see in the comments on its YouTube videos: very positive or super-negative, with nothing in between. People were with us or against us: many people loved what it represented, and many people were scared of it,” he says. Norberg also hopes that musicians won’t feel threatened by an app that lets people DJ using Spotify tracks rather than their own files. Many DJs are still prolific buyers of music – whether vinyl or downloads from stores like Beatport – which could spark worries about the income this generates for dance artists being replaced by smaller per-stream payments. “We cater to another set of users: this is more about the mass market and the consumer. Those people [DJs] will still keep on buying from Beatport forever, I think. It’s great content on there: they want WAV files and whatnot. I don’t see any problem,” he says. Norberg suggests that using a streaming music service like Spotify as the audio source – although Pacemaker can also use people’s iTunes files – is a “game changer” in its removal of the barrier of ownership when people are deciding what tracks they want to add to their sets. They have to be premium subscribers to Spotify, although the app includes a two-day free trial. Also interesting is Pacemaker’s price: free. Or rather freemium: the app is a free download, but some of its effects – Hi-Lo, Echo, Roll, Loop, BeatSkip and Reverb – are sold as in-app purchases for £1.49 each, or £6.99 for all six. Mixes can be recorded if they are using people’s own iTunes files, but for now there is no ability to record mixes of Spotify tracks, let alone share them. Rights issues are the reason, although Norberg says Pacemaker “have some ideas for how to solve this going forwards”.